Abstract  The construction of 'impossible' forms by visual artist Tamás Farkas gives the impetus for a discussion, by Farkas and scientist Péter Érdi, of scientific concepts related to graphics. The forms discussed connect constituent elements in a logical manner. The authors emphasize the necessity for some mental procedure to interpret the 'impossible' forms. Dynamic structures and various kinds of 'attractors' are discussed in connection with the visualization of motion. Self-organization, a popular concept for understanding the spatio-temporal development of evolving forms, is presented as a means to rationalize the continuous organization of lines as the cooperative organization of discrete entities. Several notions of dimension are related to the graphics. This paper is the result of discussions between artist Tamás Farkas (T.F.) and natural scientist Péter Érdi (P.E.) on the principles of organization of forms. These discussions were motivated by the works of T.F., who for a decade has been exploring the principles of organization and trying to realize his ideas in artworks using various techniques. The main intention of T.F. is to construct 'impossible' continuous forms by connecting the constituent elements in a logical manner. The term 'impossible' refers to the fact that most of these structures are impossible to realize in three dimensions. They may be visualized in a more-than-three-dimensional space, however, by certain mental procedures. The unusual appearance of these highly complex structures resuits from the obvious conflict between the plane and the quasi-plastic forms of the plane on one hand, and the unification of different views on the other. We hold M. C. Escher in high regard for the logical clarity as well as aesthetic value of his works. In analyzing Escher's works, Tormey and Tormey  claim that impossible visual images are not truly ambiguous; rather, they are the visual analogues of the familiar paradoxes of logic and language. We agree with the approach of D'Amore: "Escher in some of his pictures, for example of flying fish and of structures and interlocking shapes, makes it impossible for one to define their organization of order" . T.F. has been influenced not only by Escher but by such artists as Kaspar Thomas Lenk, Joseph Albers, Frank Stella and Max Bill, all of whom were interested in investigating the relationships between space and forms. T.F., although born in the same country as the celebrated artist Victor Vasarely, has attempted to find a different pathway and has consciously abstained from the use of spectacle in his art. The works of T.F. have aroused greater interest in Hungary among scientists than among professional artists. P.E. believes that T.F. 's graphics induce emotional effects in people interested in the study of structures and in processes leading to the formation of such structures at different levels of hierarchy. Our feeling is that experts in other disciplines, such as crystallography, structural chemistry, theory of phase transitions and critical phenomena, morphogenetics, theory of cell automata, theory of dynamic systems and synergetics, may consider the works of T.F. to have a heuristic power in science, in addition to their aesthetic value. We wish to discuss some general scientific concepts we believe relevant to the reception and acceptance (however intuitive) of these works. We emphasize that our comments are subjective associations with, and are not claimed to be a 'theoretical explanation' of, the artist's work. Macroscopic structures are often categorized into static and dynamic structures. The distinction is made on the basis of the relative magnitude of internal and external interactions. Static structures, being invariant (at least in principle) as time elapses, are maintained by large interacting forces among the constituent elements. Such structures are quite indifferent to minor environmental effects, while they generally react to major ones with complete collapse. Dynamic structures are maintained by their permanent interaction with their environment. Smoke and flame are celebrated examples of dynamic structures in the inorganic world, and some aspects of life may be approached by means of this concept. The distinction between static and dynamic structures is, however, rather arbitrary. As Haken emphasized "... structures must not be looked at as given but as evolving ..." . The concept of dynamic structures embodies two features. First, systems are made up of a complex hierarchy of smaller and larger structures and patterns in which 'things' are self-maintaining features of certain flows. (The term 'flow' is used in the spirit of Heraclitus [540  480 B.C.].) Second, flow-patterns and structures can undergo sudden transitions to new self-maintaining arrangements that will stabilize over time. The main characteristic of dynamic structures-i.e. motion-may be visualized by traces or, technically speaking, by trajectories. In a somewhat restricted sense, dynamic structures are considered the 'final states' of certain processes. More technically, the quasi-permanent forms ultimately generated may be identified as the attractors of some motion. Loosely speaking, an attractor is a subset of the phase space of a dynamic system that 'attracts' phase points from other regions of phase space into the basin of the attractor . The (equilibrium) point and the closed curve (such as limit cycle and tori) are simple attractors. A new class of strange attractors is currently in the focus of theoretical research. They have been extensively investigated in connection with chaotic phenomena [5, 6]. They have a particular topology, to some extent similar to that of the Moebius strip and the Klein bottle, as illustrated in the graph of a numerical solution of the so called Lorenz model  showing the motion of a point in three-dimensional phase space (Figure 1). Fig. 1. Numerical solution of the celebrated Lorenz model of mathematical physics referring to aerodynamic phenomena. These 'strange attractors' have a particular topological structure. The mathematical model itself can be used to describe the onset of turbulence. Linear dynamic systems tend to move toward an equilibrium point. Closed curves are more complex attractors and in two-dimensional systems may lead to limit cycle behavior. In three-dimensional (also continuous) systems strange attractors may also occur. Actually it is generally accepted that "... simple mathematical models may exhibit very complicated dynamics ..." . It is likely that dynamic systems of more than three dimensions may lead to very complex dynamic behavior and attractors even in cases of slight nonlinearities. We suggest that T.F. 's continuous forms may help to visualize high-dimensional attractors. T.F. 's research (the use of the expression 'research' seems justified, since artistic production can be the result of some systematic, logical activity) has been progressing along two main directions. Most of the graphics presented here (Figures 2  7) belong to the first direction, each being a continuous form with no 'visible' elementary constituents. They have a 'holistic' character, i.e. any arbitrary point in the structure has the same importance as any other. The color plate image represents the second direction of T.F. 's research, the cooperative organization of discrete entities. In many cases the properties of a system composed of many elements and subsystems do not simply represent a superimposition of the properties of the individual constituents. Through the interaction of the subsystems new qualities arc produced in the total system. This kind of interaction may result in spatial, temporal and spatio-temporal patterns on a macroscopic scale in an entirely self-organized way, as suggested by the concepts of Haken's synergetics. Figure 2 illustrates a relatively simple continuous organization of lines. However, its structure is more complex than the celebrated Penrose triangle. The continuous organization of lines in Figure 3 emerges as an impossible eight branched form. In the centre, a somewhat non-regular octagon can be seen. To interpret this figure one must realize that it is organized by eight different lateral views. Figure 4 has strong spatial intensity, appearing to jump out and recede from the plane. Following the trace one can see that the system of lines describes a loop. Additionally, it is clear that the figure, organized by four different views, is ambiguous. Continuous form organized in four directions. The change of direction in the vertices is 90°. Although the connections among the individual elements are realistic, the total form is 'impossible' by visual analysis. Continuous form organized in eight directions. The eight-branched star is formed by continuously interacting triangles within a spatial oclagon. Eight 'impossible' triangles appear by visual analysis. Continuous organization unifying four different views. The continuous line in the centre changes direction by 90°. Although the subforms are three-dimensional, the whole structure cannot be constructed in real space. The same organizational principle has been adopted in Figure 5. 'David's star' in the centre of the figure was not the starting point, but the result of the pattern-forming procedure. The form is organized by six lateral views. The properties of the figure are similar to those established by Figure 4, but the degree of complexity is considerably higher. A realistic spatial situation may be associated with Figure 6, and Penrose triangles considered the logical units of the organized form. The surprising visual effect of the figure is the result of the superimposition of various phenomena: spatial twisting, the interaction of small and large triangles, and self-organization of the three 'S'-forms are the main interacting factors which create the properties of the form. The hierarchical structure of the form presented in Figure 7 is more complex than in the previous forms. Apparently, lines form prisms as intermediate 'sub'-forms. These prisms are organized by six lateral views. Rotation of the figure by 60 and 120 degrees appears to be a symmetrical operation. Continuous closed form organized by six different views. The trajectory changes direction in the centre, crossing to another spatial situation. This crossing is repeated six times before return to the point of origin. The 'impossible' form is organized by six three-dimensional rectangles. Continuous organization starting from the centre can be associated with a cross in each of three dimensions. Spatial twisting, the interaction of small and large triangles, and the self-organization of the three 'S' forms are the fundamental elements of the 'rotating cross'. This rather complex form is organized by connecting six three-dimensional sub-forms. The structure is organized around the hexagonal centre. Prism-like forms are organized by six lateral views. This is not the proper place to fully define the term 'self-organization'. However, one apostle of the golden age of cybernetics, Ross Ashby, argued that since the term " .. tends to perpetuate a fundamentally confused and inconsistent way of looking at the subject, the phrase is probably better allowed to die ...". Still, the concept of self-organization seems to be very popular to describe the spatio-temporal development of evolving matter [10  12]. Self-organizing systems can be characterized by the interaction of rigid deterministic and random effects. This is the very point at which we relate self-organization to the graphics presented here: a family of figures could be generated by specifying an initial configuration and an algorithm to organize the form. Color Plate exhibits an example of the cooperative organization of a 'chain of cells' in different planes. Another interesting aspect of the figure is the appearance of symmetry-breaking. Once again we refer to Haken's short paper: "The balance between symmetry and symmetry breaking raises interesting questions not only in the natural sciences but also in aesthetics ... strict symmetry may be boring ..." . The notion of four-dimensional space has been considered mythic. Of course, the concepts of geometry can be extended to multi- as well as infinite dimensions. The increase of mathematical knowledge does not reduce the artistic challenge of more-than-three-dimensional figures. The three-dimensional visualization of impossible forms has led to the recognition of some principles: two planes may have a common point when seen from a certain point of view, although they do not have a straight line in common in reality. Additionally, visual paradoxes can be generated by illustrating forms lying in different depths. Quasi-plastic forms appearing in two dimensions may be visualized through mental processes. Theoretically, visual perception may be considered a problem of information processing , but we intend to avoid here both the explanations of theoretical approaches and the problem of visual illusions. There is no unique notion of dimension. In the familiar territory of Euclidian space, we may all be slaved to a different aspect of dimension and yet arrive at the same conclusion. But, if we venture into the realm of the bizarre, distinct notions of dimension diverge . Without going into technical details, we will briefly discuss phase space, topological, fractal, information and embedding dimensions . Phase space, as well as topological dimension, is an integer, the number of independent real numbers needed to specify an arbitrary point. Fractal dimensions of a set  may exceed the topological dimension. When a set (for our usage, a form) is 'simple' (e.g. limit cycle, torus) the fractal dimension is an integer. Cantor's set is considered perhaps the simplest example of non-integer fractal dimensions: "To construct Cantor's set, delete the middle third of a line segment, then delete the middle third of each remaining piece, and so on. The fractal dimension is log 2/log 3 ..." . Loosely speaking, strange attractors have fractal dimensions. Geometric forms known as fractals are considered by some to be artistic objects. "The esthetic beauty came as a total surprise. A premium", the mathematician Mandelbrot says. One of his former colleagues, Doug McKenna, used fractals to create illusory shapes that could not exist in three dimensions. 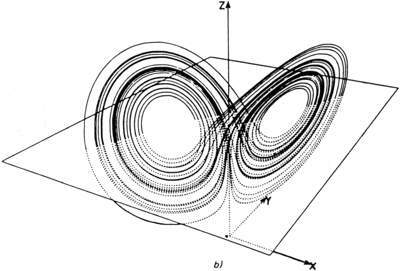 Mathematician Heinz-Otto Peitgen and theoretical physicist Peter H. Richter  have produced many beautiful pictures investigating the topological structure of certain attractors. Iterating some simple maps (using the term in mathematical sense) by the aid of a computer leads to figures that clearly illustrate the dichotomy between simple laws and complicated structures. We do not wish to state explicitly that the graphics of T.F. have fractal dimensions but that the procedure of construction of some graphics is strongly similar to those leading to fractal dimensions. Of course, it is natural to question how the notion of dimension for 'impossible' forms can be defined. Acknowledgements  We are grateful to I. Hargittai and S. Koch for moral support and comments on the manuscript.